Today the Youth in Action Seminar begins in Krugersdorp, Gauteng. It is a space for academics, professionals, politicians, donors and others who want to reflect on the value and importance of culture in the development of communities. To do this, share advice, knowledge and ideas that can be applied in South Africa and in other developing countries. Among the speakers are Alfons Martinell, head of the UNESCO Chair at the Universitat de Girona, partner of the project, Jerry Mabuza, chairman of GOMACC also project collaborator, Lucina Jimenez, president of the Observatory for Communication, Culture and Art; Munyaradzi Chatikobo, director of the 'Drama for life'; Yvette Hardie, deputy chair of Arterial Network, or Paula Moreno Zapata, Manos Limpias Foundation. Soon will be a round table in which representatives of various cultural institutions will share their experience and perspectives in this area. The inauguration will be provided by Paul Mashatile, Minister of Arts and Culture in South Africa and Roeland van de Geer, Head of Delegation of the European Commission, which is cofunding the project. Parallel to the Festival, it organizes a seminar with the participation of young people involved in the Project. Thus, it is intended to establish a solid bridge between the reflections of the Seminar and the dynamics of the project means to achieve a strong impact on participants demonstrating the importance of cultural actions to strengthen the development and social cohesion. 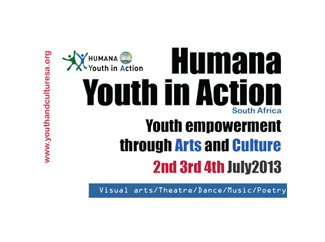 The project is demonstrating the creative force South African youth can develop when given the opportunity and support to learn new skills, interact and formulate their own views on issues of importance to their communities.